Claim Concepts team of Public Adjusters in the Florida Keys are working tirelessly to assist Policyholders with claims due to Hurricane Irma. Hurricane Irma victims are facing what is going to be a challenging journey towards recovery. Surviving the storm itself is only the beginning, now the claims and rebuilding process begins. Many business owners and homeowners are going to encounter what will likely be a challenging experience dealing their insurance claim when going at it alone. It is never as easy as the TV commercial says it will be. As State Licensed Florida Public Adjusters we are offering complimentary claim consultations to Business Owners and Homeowners throughout the Florida Keys. What should you expect with your Hurricane Irma Claim? Hurricane Irma claims in the Florida Keys are going to be complex, to say the least. These properties have suffered extremely high winds as well as flood damage from the surge. We have been seeing insurance companies sending out Engineers prior to their adjusters even visiting the homes. Don’t be fooled by this tactic as it is likely in an effort to differentiate between damages due to flood and wind as the responsibilities will fall under different insurance companies. The adjuster that will eventually make it to your home will most likely be an independent adjuster (independent contractor, can work for several different companies) from out of town as there are simply too many claims for any company to handle with their in-house adjusters. These independent adjusters are handed multiple claims (sometimes in the hundreds) to handle and are forced to work extremely long hours to possibly keep up. Their main job at this point is to view your loss and gather information necessary to prepare a preliminary estimate of your damages. As nice and caring as these adjusters may seem, they still do have a job to do and are instructed by the insurance company as to how they would like their claims handled. As Licensed & Bonded Florida Keys Public Adjusters, we are the ONLY adjusters that will exclusively represent your interests in a claim. It is illegal for any person, other than a Public Adjuster or Attorney to represent your claim to your insurance company – BE CAREFUL as many people will offer these services but it is considered the Unauthorized Practice of Public Adjusting and it is not legal. How does it work when hiring a Public Adjuster and how do they get paid? As Florida Keys Public Adjusters we handle all aspects of your claim to ensure that you recover every last dollar possible under your policy. Public Adjusters are in the business of keeping insurance companies honest by ensuring that the policyholder recovers an equitable settlement for all of their damages. We handle everything from filing the claim to presenting all of your damages in an effort to ultimately recover the maximum settlement that you deserve. We are the Insurance Claim Experts that you need in your corner. The best part is that there are no upfront fees as we work on a small contingency fee based on a percentage of what is recovered from the insurance company and with that being said, we only get paid when you do. In the image to the right, you will see the results of a study commissioned by Citizens Insurance on Florida Public Adjusters. 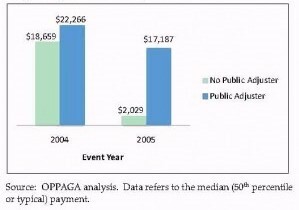 The study conducted by the Office of Program and Policy Analysis & Government Accountability (OPPAGA) evaluated both daily claims and Hurricane related claims during the busy Hurricane Season of 2005. 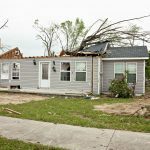 The results were likely NOT what Citizens were hoping to see as the study proved the value of having a Public Adjuster to represent your interests throughout the claim. The results concluded that during the 2005 Hurricane Season, the policyholders that were represented by Florida Public Adjusters recovered on average 747% more than policyholders that tried to handle the claim on their own. You wouldn’t send your financials to the IRS and let them prepare your tax return, would you? Of course not as it is obvious they are not looking out for your best interest. We are the claim experts that will look out for your interests and ensure that you recover the maximum settlement for all of your losses. Speak with our Florida Keys Public Adjusters Today!